Felix Rosenqvist (born 7 November 1991) is a Swedish racing driver currently racing for Chip Ganassi Racing in the IndyCar Series. Rosenqvist started his single seater career in Asia, he won the 2008 Formula Renault 2.0 Asia and 2009 Formula Renault 2.0 Sweden/NEZ titles. In 2010 he was fifth in the German Formula Three Championship with 2 victories, 8 podiums and 1 pole position. He also attended the 2010 Macau Grand Prix Formula Three where he finished on ninth after having qualified seventh in his debut with the same Swedish/British racing team Performance Racing. For 2011, he graduated to the Formula 3 Euro Series with the Mücke Motorsport team, where he finished 5th with 1 win, 10 podiums and 5 fastest laps, and won the Masters of Formula 3 in his rookie year. In 2012 he finished third in the 2012 European Formula 3 Championship and finished second in Macau Grand Prix. The year after he narrowly missed out on the 2013 European Formula 3 Championship title to Raffaele Marciello, however winning the Masters of Formula 3 for a second time from pole position. In Macau Grand Prix he started the race from the front row but collided with Raffaele Marciello and Pipo Derani to retire in the first lap. In 2015 he switched to Prema Powerteam, claiming the 2015 European Formula 3 Championship title with 13 victories, 24 podiums and 17 pole positions. He would also take his second consecutive victory in the 2015 Macau Grand Prix, again from pole position. His extended Formula 3 career meant that he would become the most successful Formula 3 racer of all time. In February 2016 he announced that he would compete in the 2016 Indy Lights series for Belardi Auto Racing  as he failed to bring budget for a continued programme in GP2 Series with Prema Powerteam. Rosenqvist had a reduced programme in the series, competing in only 10 of the 18 races, as he later in the season would have clashing commitments with his sportscar programme with Mercedes-Benz in Europe. He scored 3 wins in his campaign. He had a successful test in IndyCar with Chip Ganassi Racing at Mid-Ohio Sports Car Course, saying he would be happy to return to the American racing scene later in his career. Rosenqvist joined the 2016 Blancpain GT Series Sprint Cup together with French Tristan Vautier, driving a Mercedes-AMG GT3 for AKKA-ASP Team where they together scored 1 victory, 3 podiums out of the 10 races and finished 7th in the overall standings. The same duo together with Renger van der Zande lined up for the classic 2016 24 Hours of Spa where they reached 2nd place after all Mercedes-Benz cars have been given a 5-minute stop and go penalty. Rosenqvist started off 2016 with a role as official reserve driver, having continued his long partnership with Mercedes-Benz before being promoted to a race seat with one of the cars ran by ART Grand Prix following Esteban Ocon's departure to Manor Racing in Formula One. He made an impressive debut in Moscow where he finished 10th, and scoring points in his first ever race in the Deutsche Tourenwagen Masters. 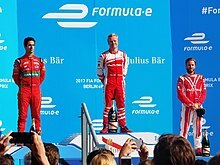 On 22 August 2016, it was announced that Rosenqvist would partner former F1 driver Nick Heidfeld at the Mahindra Formula E team for the 2016–17 Formula E season. On 10 June 2017, he won the first race at the Berlin ePrix. It would be the first victory for him, as well as for his team. At the end of 2018, he made his last race start in Formula E before moving on to the Indy Car Series. Rosenqvist is known to be a street circuit specialist having won in Grand Prix of St. Petersburg, Honda Indy Toronto, Grand Prix de Pau, Norisring and Macau Grand Prix twice, where he has started 7 times from the front row. Rosenqvist raced in the Super Formula series for the 2017 season with Team LeMans. His team is the same as his manager Stefan Johansson contests Japanese F2 in 1981. Rosenqvist raced in the Super GT series for the 2018 season with Team LeMans, the same team he raced in the Super Formula series the year before. He replaced Andrea Caldarelli's position in the team. † As Rosenqvist was a guest driver, he was ineligible for points. * Season still in progress. † Driver did not finish the race, but was classified as he completed more than 90% of the race distance. * Season still in progress. ^ Simmons, Marcus (23 February 2016). "Macau GP winner and F3 champ Rosenqvist secures Indy Lights move". autosport.com. Retrieved 12 April 2016. ^ Mitchell, Scott (August 22, 2016). "Felix Rosenqvist joins Nick Heidfeld at Mahindra for 2016/17 season". Autosport. Retrieved August 22, 2016. ^ "Rosenqvist gets 2018 Super GT drive with Lexus". Motorsport.com. February 8, 2017. Retrieved February 9, 2017. 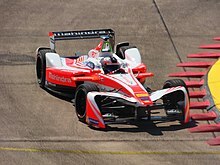 Wikimedia Commons has media related to Felix Rosenqvist. This page was last edited on 16 April 2019, at 20:08 (UTC).